The children at Bandara Children’s Service in Bega are donning their leathers and helmets and revving up these days with the establishment of the Bandara Bikies. Mounted on new trikes and scooters, the children are learning how to keep safe in traffic, on bikes or as pedestrians. 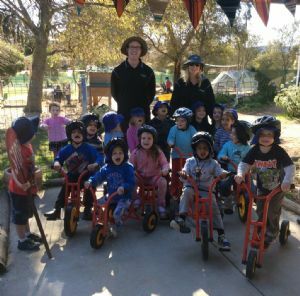 The Bandara Bikies program was funded by the NRMA Insurance Community Grants Program to help buy trikes, scooters, helmets and road safety resources that the children can use in conjunction with road safety programs. Bandara’s Educational Leader Amanda Bradfield said the centre has a safe riding environment for the children to learn new riding skills and perfect their steering, acceleration and braking skills. “They will build gross motor strength and learn how to negotiate turn taking with their friends,” she said. “We all want to send a big thank you to the NRMA Insurance Community Grants Program that has got this project, and the children, in the bike saddle!” she said. Photograph: Bandara Preschool teachers, Daryl Kelland and Amanda Bradfield with the little ‘bikies’.